DDT exposure, pregnancy, breast cancer: Public health researchers find correspondence. 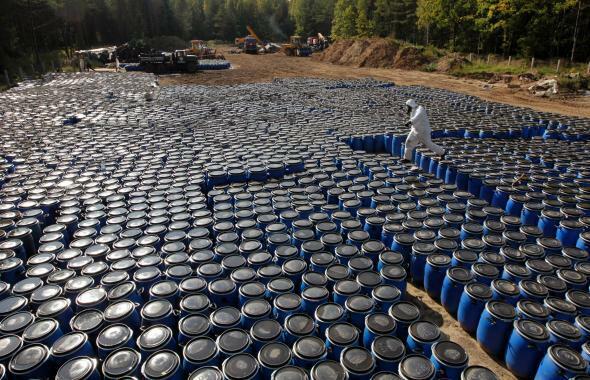 Barrels of pesticide, including DDT, at a site in Belarus. Researchers affiliated with California’s Public Health Institute, the University of California–Davis, and the California Department of Toxic Substances Control have published a study in the Journal of Clinical Endocrinology & Metabolism documenting higher breast cancer rates in women whose mothers had higher levels of the pesticide DDT in their blood during pregnancy. Among the women who were diagnosed with breast cancer, 83 percent had estrogen-receptor positive breast cancer, a form of cancer that may receive signals from the hormone estrogen to promote tumor growth … In addition, the scientists found women with greater exposure to o,p’-DDT were more likely to develop HER2-positive breast cancer, where the cancer cells have a gene mutation that produces an excess of a specific protein. Basic research studies where breast cancer cells were exposed to DDT have found the pesticide activated the HER2 protein. As the Washington Post notes, earlier research had found no apparent connection between DDT exposure and breast cancer—but had covered individuals exposed later in life, rather than in utero. The new study covered 118 women who had been diagnosed with breast cancer by age 52 and 354 who had not, a sample that the study’s authors described as small. They also cautioned that some other as-yet unknown environmental factor, rather than DDT, could have caused the observed effect. The breast cancer study is part of a large, long-term research project conducted with the participation of 20,754 pregnant women who were covered by the Kaiser Foundation Health Plan between 1959 and 1967 in the Oakland area.